When Sammy introduced the Samsung Galaxy S4 Active last year, it seemed as though many owners of the beloved Galaxy S4 were suddenly shocked by the revelation – a waterproof version of their existing handset. Naturally, the nature of the phone’s arrival would’ve been less shocking if Galaxy S4 owners were somehow prepped ahead of time about the Galaxy S4 Active’s impending arrival, but they weren’t. Instead, the handset came out of nowhere taking everyone by surprise. Who wouldn’t be a bit pissed, especially when it bears nearly the same hardware specs of the flagship? The feeling is less intense this time, thankfully. 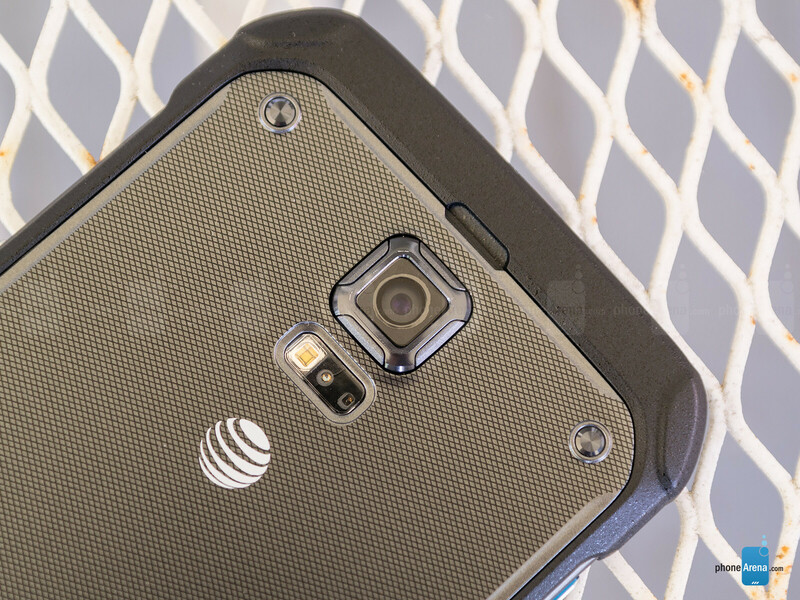 Even before its official announcement, we all knew that we were going to see variants of the Galaxy S5 in due time – with one of them being an even more ruggedized version. 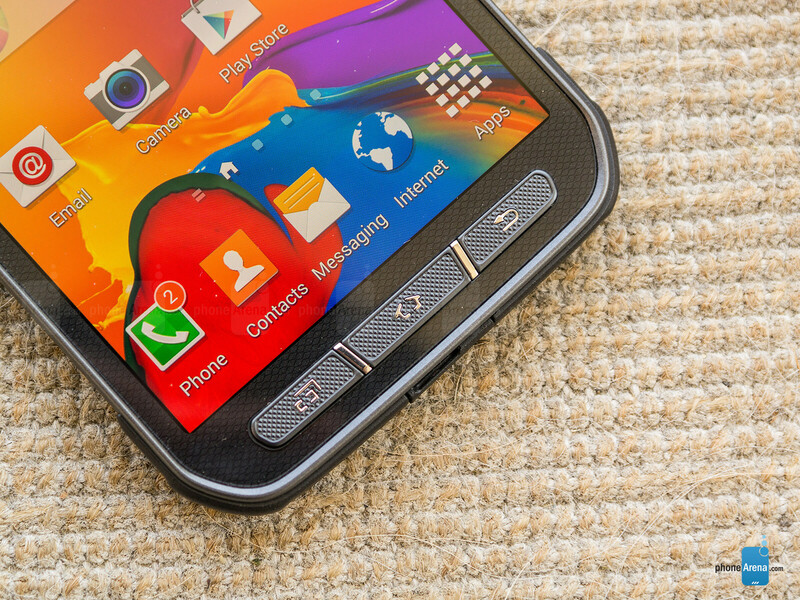 Enter the Samsung Galaxy S5 Active, which like before, bears many of the elements and specs of its esteemed cousin. 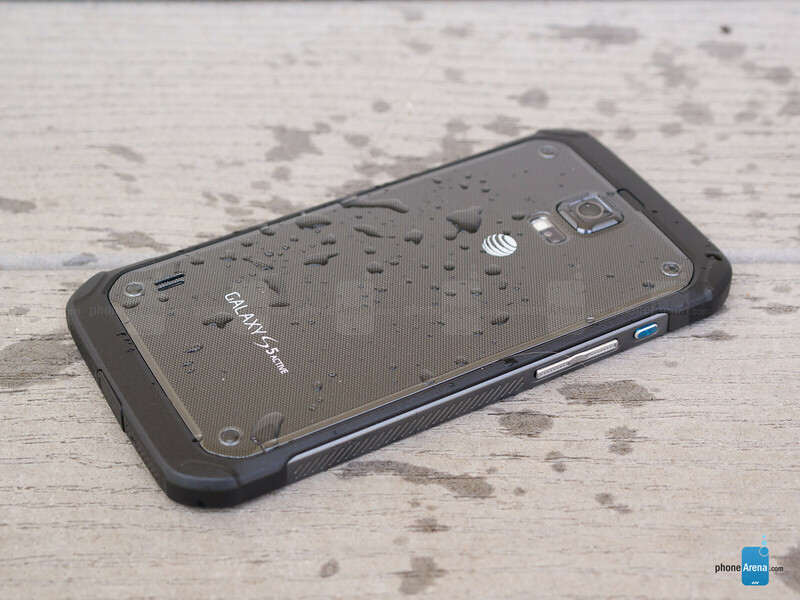 As we already know all too well, the Galaxy S5 now has a water-resistant element, so why even bother with the Active? Read on and we’ll clear things up more regarding it. 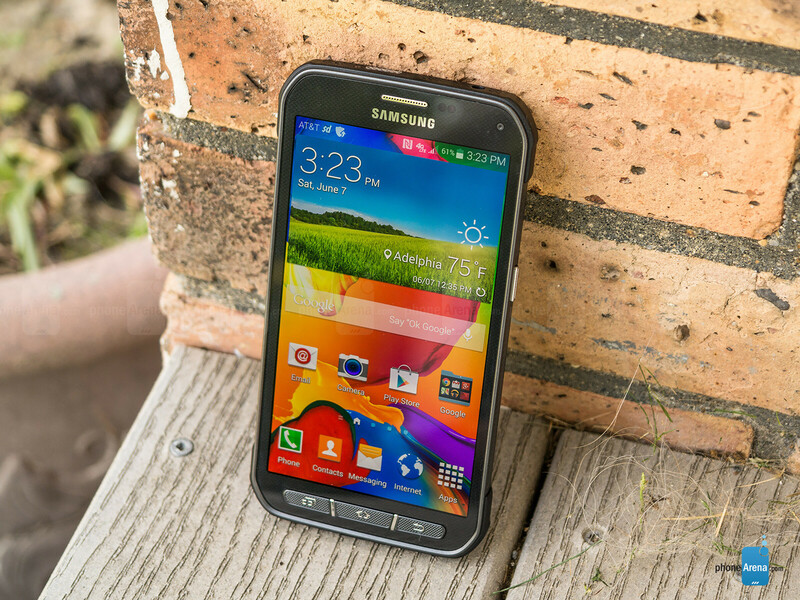 Looks and beauty isn’t what the Galaxy S5 Active is after, but instead, it offers superior protection. If you weren’t terribly sold with the Galaxy S5’s design, then you won’t find anything astounding here with the Galaxy S5 Active. Just like last year’s Active, this one sports a more ruggedized design – one that doesn’t care for a fanciful looks. Rather, it’s comprised out of sturdier plastic materials that seem light years more solid than the one used by the Galaxy S5, so it’s able to withstand serious punishment. Naturally, the design language of the phone makes perfect, especially when it meets military specification 810g and is IP67 certified. No doubt a solidly constructed thing, it can really take a beating like no other. 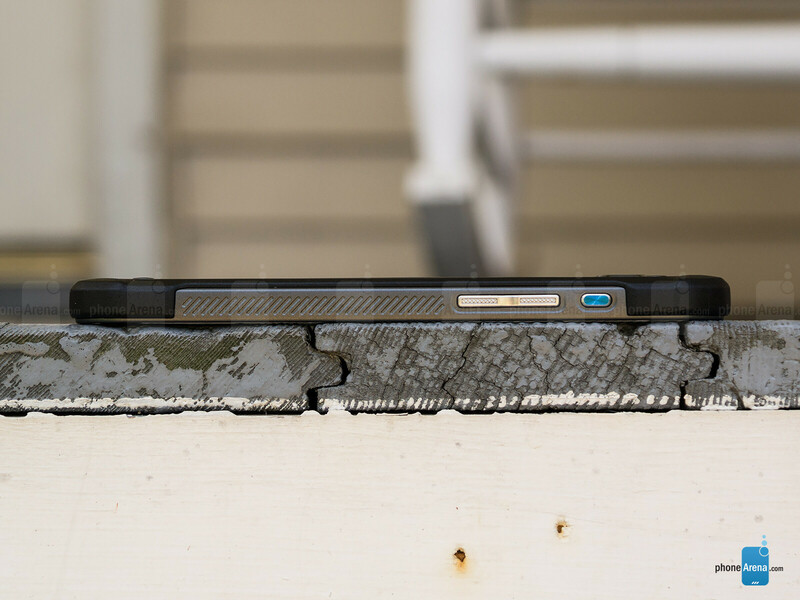 Whereas the Galaxy S5 might flex and bend when abused, the Galaxy S5 Active is unfazed by any sort of destructive handling. Topping it off, its built-like-a-tank chassis makes it dust proof, drop proof, shock proof, and water resistant in up to 1 meter of water for 30 minutes. You can have fun using the phone in a pool with no worries, but if you drop it on rough terrain, its body is obviously prone to scratches. Despite having an unsavory design, Samsung is kind enough to offer it in three colors – titanium grey, camo green, and ruby red. Our only complaint is just the slippery feel of the handset. Looking around the body of the Galaxy S5 Active, it packs many of the same familiar ports and buttons already found on the Galaxy S5. Specifically, they include the power button, volume control, 3.5mm headset jack, IR blaster, microUSB 2.0 port, and yes, even a heart rate sensor in the back of the phone to measure our heart rate. Indeed, health fanatics will appreciate the heart rate sensor, but in all fairness, it merely adds only to its geek cred. However, Sammy has opted to omit the finger print sensor, and swapped the usual capacitive Android buttons with the physical set here. We don’t mind the latter change, seeing that a physical response is something we’d prefer with a ruggedized phone, but some folks might be turned off by the fact they removed the finger print sensor. Needless to say, it would’ve been nice to see, but nevertheless, we can live without it. In the past, the battery compartments of most ruggedized phones would employ a latch mechanism to keep the battery compartment tightly closed. 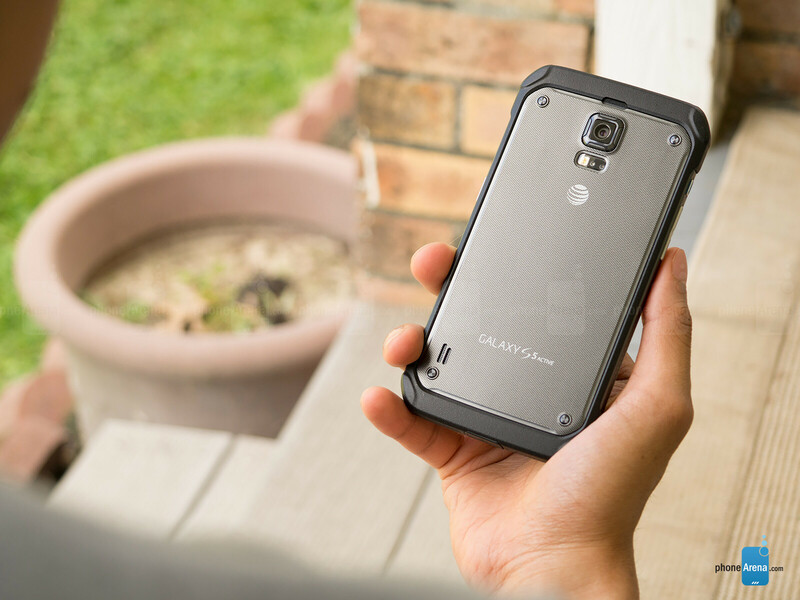 Well, the times are changing because the Galaxy S5 Active, much like its cousin, only relies on a snap-on plastic rear cover to keep it firmly protected against submersion. Luckily, the battery continues to be accessible on this one – plus, there’s a microSD slot here as well. With this years’ Active, Sammy didn’t make any compromise with the display – it’s the same potent one found in the Galaxy S5. Would you look at that? Sammy manages to retain the same exact display featured on the Galaxy S5, a 5.1-inch 1080 x 1920 Super AMOLED display with Gorilla Glass 3. Not surprisingly, since it delivers a darling pixel density figure of 432 ppi, it’s never a problem trying to distinguish fine details. It’s so crisp and clear to the eye, so it’s super easy to make out even the miniscule text in the web browser. When it comes to color reproduction, it varies depending on the screen mode we select. Amongst the available ones, we find “cinema mode” to produce the most accurate colors – with very few discrepancies between color gradients. Before testing it out, standard mode would’ve been the presumed choice, but it tends to be a bit greener than we’d like. All told, the panel itself continues to be over-saturated, which isn’t a bad thing per se because of the attractive glow it emits. Better yet, we have no difficulty making out the display under sunny conditions thanks to its maximum brightness output of 491 nits – plus, it jumps into this high-contrast mode outdoors to increase its visibility. Just like the Galaxy S5 before it, the Active’s Air View feature allows it to track our finger while it’s hovering over the display. Yes I agree, but this is the active model. To achieve what they achieved in the S5 Active in terms of ruggedness, you have to sacrafice some things. To me the battery life is not as bad as you claim in such a rugged but insanely spec'ed phone. You win some & you lose some. The S5 has the battery life but the S5 Active beats it in superior protection. A 9.0 is an EXCELLENT review. When it comes to shock proofing S5 may beat the S5. However, waterproofing is still questionable since both phones offer that silly back cover that may not seal well if one is careless. Sony Z2 may offer better since small flaps with almost idiot proof sealing. Still, I would not deliberately dunk them in water. It more like I could use them in a humid or rainy day in case of emergency. Z2 is definitely better than the regular S5 but in the rough stuff glass and aluminum will not mix with pavement and rocks. S5 Active is a class on its own and even the very first of the top of the line rugged smart phone ( S4 Active was a big joke). Already expected that since Xperia Z. Sony and Samsung use this type of O-ring in its flaps. This gasket is damage over time by friction and must be replaced. This is also the reason that I will never dunk them on water deliberately. I prefer waterproof flaps that are sealed with a latched like those found on Otterbox and Aquapak or in all diving electronic equipment. Or at least a spare O-ring would be nice. Very true guys, everything wears out over time, but still the device shouldn't be used in water over long periods of time... It's really just insurance for the phone in case it does fall in water from time to time. You definitely don't want to go diving with these phones. Yes Sir, I saw that. VERY tough is the Sony Xperia Z2. battery life is fine. I finish with about 40% after continuous use throughout the day. Check out th camo green edition guys .. it looks gorgeous!!!!! Yeah, if they make a phone designed for people who need a rugged phone, then a lot of them go outdoors a lot. And a lot of them might go camping or hiking, so they would probably need good battery life and a good camera. And if the people who buy this don't go outdoors a lot, they still would like good battery life and a good camera. I agree. This is much better than the colored band aid. lol You know there are also other colors besides band aid gold right? +1 for the sarcasm. The thing is S5 is designed for a more wider demographic. So a 16 year old and a 60 year old would like the design. However, Active's bolt on the back design won't really appeal to a 'granny'. And tell me why a granny would need an active phone to begin with? Speak for yourself! Although I prefer the design of my Z2, I do like the blue S5. It's fresh. 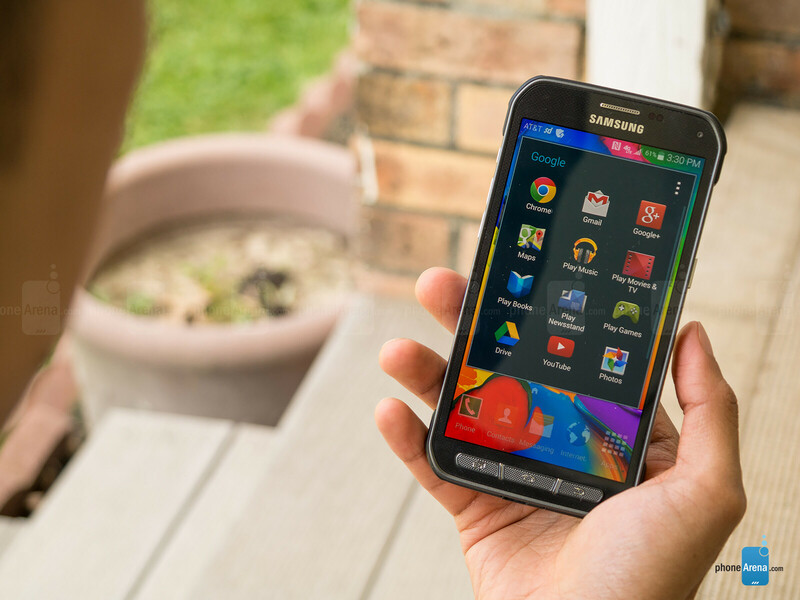 Is it me or does this phone actually look better than the original Galaxy S5? I like it a lot. I have the camo green, and coming from a korean guy, I never knew I actually grown to LIKE the design rofl! Wow! Audio out put is even better than the S5. I'm willing to sacrifice some low light shots from is camera for a better 3.5 mm output since I spend most of my time listening to music on the trails.